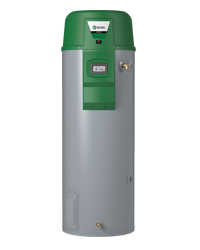 The GDHE-75 Vertex™ Power Direct Vent gas water heater offers unprecedented levels of performance to meet your hot water needs. Featuring a 75-gallon (nominal) tank and a 100,000 BTU gas burner, the GDHE-75 Power Direct Vent delivers a thermal efficiency of 96%, a Uniform Energy Factor of 0.86, and a recovery rate of 129 gallons per hour. It carries a 6-year limited warranty, and meets Ultra-Low NOx emission requirements. Spiral heat exchanger keeps hot combustion gases in the tank longer to lengthen the heat transfer cycle. 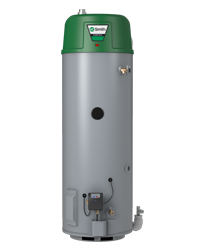 It's positioned in the center of the tank for more even and efficient heat distribution, which saves money on operating costs compared to a standard gas water heater. For installation with combination space heating/potable water heating applications (such as with air handlers) or any system requiring a recirculating hot water loop. Large LCD display; Precise temperature control; Advanced diagnostics; iCOMM Compatable. 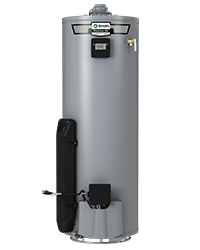 The GDHE-75 Vertex™ Power Direct Vent gas water heater is designed specifically to generate a constant flow of 4 gallons per minute, resulting in continuous hot water for your home. 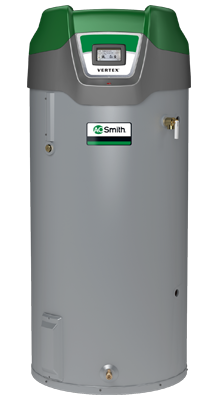 Height w/Draft Hood: 64 3/4"
Through an inspired blend of innovation, efficiency and years of industry expertise, A. O. Smith has created a state-of-the-art family of Vertex™ products that provide a long-lasting supply of hot water. They are easy to install, with dimensions and installation requirements comparable to standard power-vent and power direct-vent units.